More on the homemade vegetable pasta chapter… I am in my Italian cooking phase, I left French food aside and going back to my roots. Playing with pasta is a lot of fun. I love making homemade pasta, and having my hands in flour. Kneading the dough, relaxes me, it’s like a therapeutic anti-anxiety session. So I guess it’s better than taking Xanax! I Found my pasta machine after searching for an hour, it was stuck at the bottom of a drawer, hidden with hundred of other kitchen utensils. I did not feel like using rolling pin (mattarello) this time, the beet tagliatelle were quite time consuming and I did not have time. Making those carrot tagliolini took a lot longer than when making regular pasta with plain flour and no vegetable, because the dough was somehow soft, due to the carrots and the water they contain. So I had to add flour constantly to prevent dough from sticking. I’m not sure how to translate tagliolini in English, maybe angel hair? I think angel hair are thinner than those. My grandma used to make tagliolini in a tomato broth and we would eat them in a soup-based consistency. 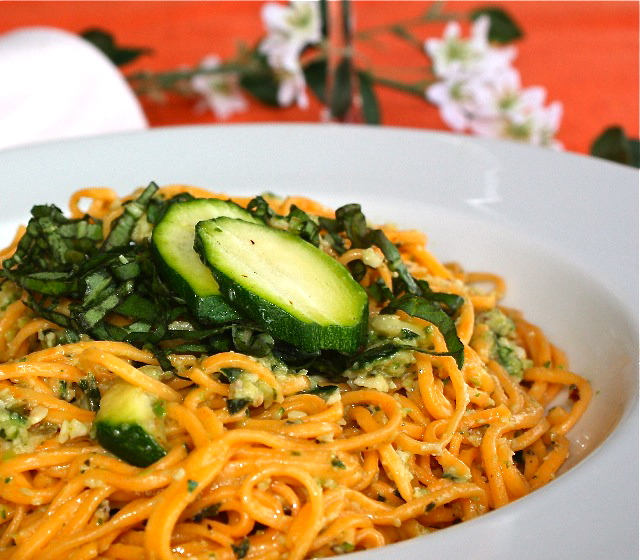 Tagliolini are a typical traditional pasta, larger than capellini but narrower than tagliatelle. When made fresh, they cook fast and usually they’re served with light sauces. 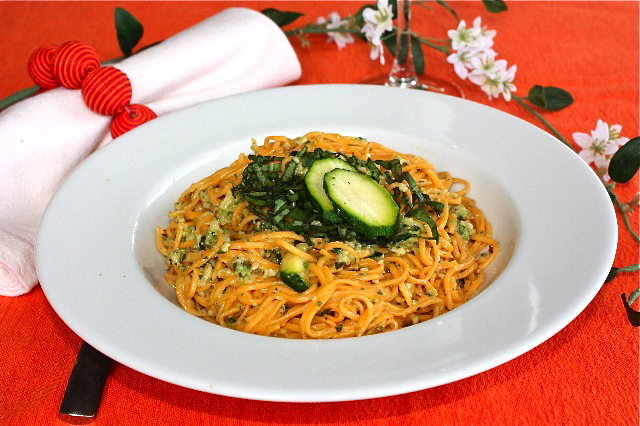 Zucchini pesto is quite tasty with a lighter texture than regular pesto since it mostly contains zucchini, you can slightly taste the flavor of zucchini which tends to be bland, but enhanced with basil, and parmesan. Cook carrots in water until well cooked all the way through. Drain, let cool and puré with a potato masher, or a mixer so that you get a smooth and thin cream. Place in a mixing bowl, add flour, egg and mix to get a homogeneous dough. Remove from bowl and start kneading on a flat surface. At this point, you might need to constantly add flour, so that dough does not stick to the working surface. Proceed like you would make regular pasta sheets with your pasta machine. Cut zucchini in medium size pieces. Place in a blender with the other ingredients and blend to a medium consistency. Adjust with some additional olive oil if the pesto is a little thick and blend a little more. Cook pasta in a large pot of salted boiling water for one minute and drain. Toss with pesto and serve hot. This entry was posted by silvia on August 26, 2009 at 7:51 am, and is filed under Pasta, Vegetarian - dairy. Follow any responses to this post through RSS 2.0.You can leave a response or trackback from your own site. Interesting! Never had zucchini pesto before. I’ll have to try it! How beautiful! The carrots add such a punch of color. 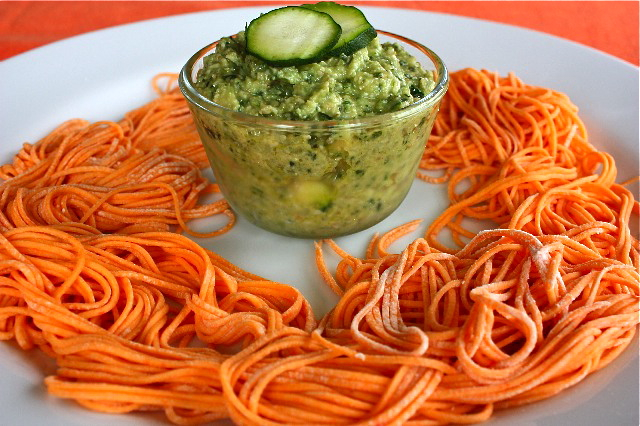 I love the idea of using zucchini in pesto — it all looks delicious!